The fact that an 8TB hard drive exists is quite amazing, given that magnitude of the content that could be stored on that drive. So the fact that all of Vinpowerâ€™s optical disc duplicators, manual towers and autoloaders, can utilize the 8TB HDD to store projects/jobs, is also an impressive feat. Itâ€™s also fair to think, why would anyone need such a large HDD inside a duplicator. When you think about the fact that content is getting larger and larger, for instance, UHD/4K content could be over 100GB per disc, then itâ€™s easy to see how a user would need a much greater amount of space to store each project for future duplication jobs. Couple that with Vinpowerâ€™s new Blu-ray Copy Protection (BCP) feature, where the protected files would need to reside on the HDD to make additional protected copies without requiring additional licenses, and the amount of space needed could add up quickly. 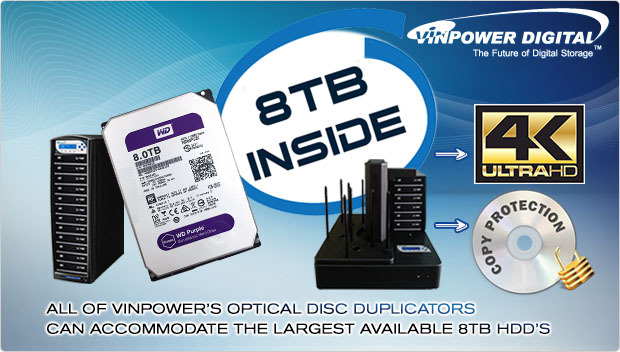 Regardless of whether youâ€™ll need an 8TB HDD for your duplicator or not, the key is that Vinpower strives to stay ahead of the curve and is constantly expanding the boundaries of whatâ€™s possible for our duplication hardware. As media manufacturers like Taiyo Yuden close their doors, the remaining companies, like CMC, are finding a much greater demand then their current production can handle. As shown in the below link to the CDRinfo article, CMC will have to both increase pricing and production will take longer for many customers in the near future. This will affect more than CMC, but is an industry wide problem for the remaining optical disc manufacturers. At this time, itâ€™s critical to make sure you work closely with your source for media to make sure you can secure the quantity and formats you need when you need them. Vinpower is fortunate to have strong production capabilities and smart forecasting to help navigate these times of scarcity. Contact us for your next media requirements and see how great our quality and reliability will be for your business. 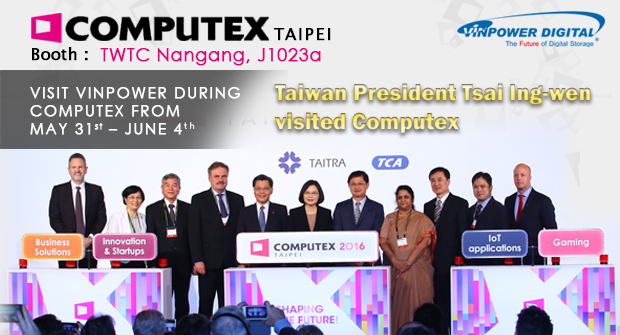 Taiwan’s newly elected President, Tsai Ing-wen, visited Computex to highlight its importance on the global stage. Itâ€™s not often that a head of State will visit an electronics tradeshow, but on Tuesday, Taiwanâ€™s President Tsai Ing-wen, took the opportunity to view for herself the latest in the consumer electronics at the Computex Trade show, taking place in Taipei, Taiwan. President Tsai Ing-wenâ€™s visit showcases the importance of Computex to both Taiwan and the global landscape.